Uh oh! A Mutant Chia, stark raving mad from how envious he was of the Jolly Jugglers' talents, has kidnapped the dynamic duo's sister! It's up to you to guide them up the Mutant Chia's hideout, a huge, scary tree, and then square off against their lunatic foe in a battle for the ages! There are a total of seven stages in this game, not including the boss battle at the very end. There are quite a few good ways to rocket your score up to over five thousand, enough for anyone to get a gold trophy in the game, and I'm going to tell you them all. But first, let's get some introductions going. Meet Jolly and Olly, the two heroes in the game with a more-questions-than-answers-type of skill with guns, missiles and the like. Being twins, they look almost identical; the way you can tell them apart are by the letters, "J" and "O" respectively, on their shirts, and their colors. Jolly is a Green Chia and Olly is a Purple Chia. Olly carries a spiffy-looking laser gun and Jolly carries a not-so-spiffy-looking bazooka; both are fired with the X key or space bar. Believe it or not, their colors matter; each must collect ammunition in the game to continue blasting the bad guys, the ammo matching in color to each Juggler. To make them jump press the up arrow key, to switch the brother who's firing press the Z key. However, both brothers have one thing in common; if one dies, they both die. The three lives they start with are for both of the brothers; they don't have three each. On that note, they do have their own amounts of hitpoints; four each. At the beginning of the game they both start with one hundred percent health, and every point of damage they take lowers it by twenty five percent. When either one of their amounts of hitpoints reaches zero, they both lose a life, like I've already said. They just don't look very menacing, do they? The Slorg simply crawls backwards and forwards on the ledge it's on until it either hits you or you shoot it. They're easily the wimpiest enemy in the game. The Tenna hops along ledges with absolutely no concern for its own safety. Or yours, for that matter. It can jump up and down different ledges, making it the most maneuverable enemy in the entire game. The Drackonack races across ledges until it (very slowly) falls down to the next, making it quite a threat for any inexperienced players. One hundred hit points, constant color changing and balls of deadly energy? What were those Jugglers thinking when they decided to go challenge the giant Mutant Chia boss for their sister? Well, they had probably read this guide and so learned his weaknesses. Yup. That's gotta be it. Really, it's not impossible to beat this guy; in his stage, you have three ledges: one to the right, one to the left and one a bit above the middle. The boss, as said before, constantly changes color from green to purple and back again, making you have to continuously switch Jugglers to keep fighting him. Every time you shoot him with the correct Juggler, his hit points will go down by one and you'll get a point to match; when he's dead and the game ends, you'll get an extra two hundred points bonus, just as a sweet surprise. But I'm getting ahead of myself now. "ONE way or another, I'm gonna GET those Jugglers!" Along with color switching, the nefarious Mutant will also launch three sets of three energy balls at you, although they're easy to dodge if you scurry to the far edge of either the left or right platform. Plus, watch out for his rolling attacks, when he curls up into a ball and zips to the other side of the screen; if you're not ready to dodge them, you probably won't. 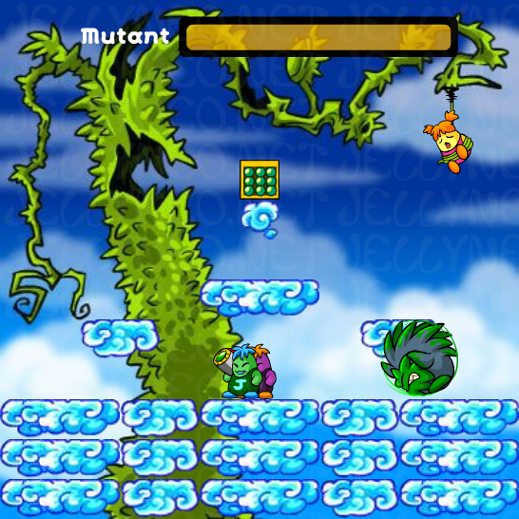 As long as the fight goes on, random power-ups will drop from the sky and land in the center of the middle ledge, although no fruits or extra lives will. Whilst the jump power-up is virtually useless, the shield is extremely useful as you can jump down from your ledges of safety, unafraid of any harm to come to you, and start blasting away at the boss. There's still the gun power-up, though, and it's almost as good as the shield. With it, when you shoot the boss, he'll take double damage! In this game, there are quite a few nifty power-ups and other items to collect, some absolutely essential to you getting a trophy score (and I mean that quite literally). First, I'll break down the types of things there are: power-ups, fruits, ammunition and extra lives! The jump power-up lets whichever brother collected it jump a bit higher. It's not really very useful. The gun power-up gives whichever brother collected it shoot two lasers/missiles, one above the other; it's only really useful in the boss stage. The shield power-up is by far the best; when either brother collects it, an indestructible force field surrounds them both for a few seconds! Make use of it while you can! Like I said, there are seven different stages in Jolly Jugglers, but what's so special about the seventh? Simple: it's right before the boss. When you get to the boss you can't get any more extra lives or fruits, as said above. Without those lives and fruits there'll be no getting a trophy for you. The idea, devised by yours truly, is that you want to get as many lives as possible, hopefully collecting a bonanza of fruits along the way, before getting to the seventh stage. There, you'll find about thirty-two petpets, if my memory serves me correctly, all but one of which you should go ahead and shoot. The very last one, a Purple Slorg, on the same ledge as the exit, is the only one you should spare. After all you've been through, after all of the struggling, there's only one thing left to do;you have to die. Yes, you must now die! You see, when you die, you retain every single point you had before you lost that life; you're basically exchanging all of those extra lives for major points! Plus, since you're still on a regular level, you still have the chance for even more extra lives and fruit! But that's not all; after you've trimmed yourself down to one life, go ahead and take that Purple Slorg at the end of the level and proceed to the boss stage. Pummel him down to one or two hit points and make sure to have at least fifty percent health left on each Juggler, just for safety. Next comes the most agonizing part of it all: collecting as much ammunition from the top ledge as you can until your brain is about to explode from complete boredom. When you're finally fed up that, wait until the boss switches color to match whichever brother has the most ammo. Then, jump back down and start bombarding him with your new firepower. Don't worry about the game ending before you've cleaned out your ammo; it'll only end after a few seconds of the boss getting hurt with no hit points left. So, now you too can get yourself a gold trophy, an ultimate high score and a gigantic ego from our favourite game on Roo Island! First, keep starting the game over until you get a bare minimum of one, preferably two, extra lives on the first level. Second, if you don't get at least five (absolute minimum) extra lives by the seventh level, start over. Third, progress to the top of the seventh stage to face the last Purple Slorg; let it keep killing you until you have one life left. Fourth, if you don't have a score to your satisfaction when you have one life left and you're ready to go on, restart. Finally, for an even slightly higher score, do the same thing as above except firing slowly. That way, while you're still firing, more ammo might drop down for you to quickly collect, jump back down and continue firing. Did you know that there's a secret level in JJ? I bet not; that's why you're reading this guide, after all. Anyway, just click on the eye of the Green Drackonack on the main page and you'll start the level "Drackonack Attack." You see, there's only one ledge in it and it's too high to jump onto. Meanwhile, a possibly-endless hoard of Drackonacks will fall onto it, about one every five seconds or so, stopping only when you get a game over. Unfortunately, you can't send in any scores for that level, so it's just for fun. How rare is a screenshot of something so rare? Wow. Occasionally this game can get a bit tricky if you don't know what obstacles are ahead of you. If you need to double check where the next enemies and platforms are, go ahead and use the images below. Well, now you know everything you can possibly ever learn about Jolly Jugglers, and have learned of a game where YOU could ACTUALLY get a gold trophy! See you on the High Scores Board!